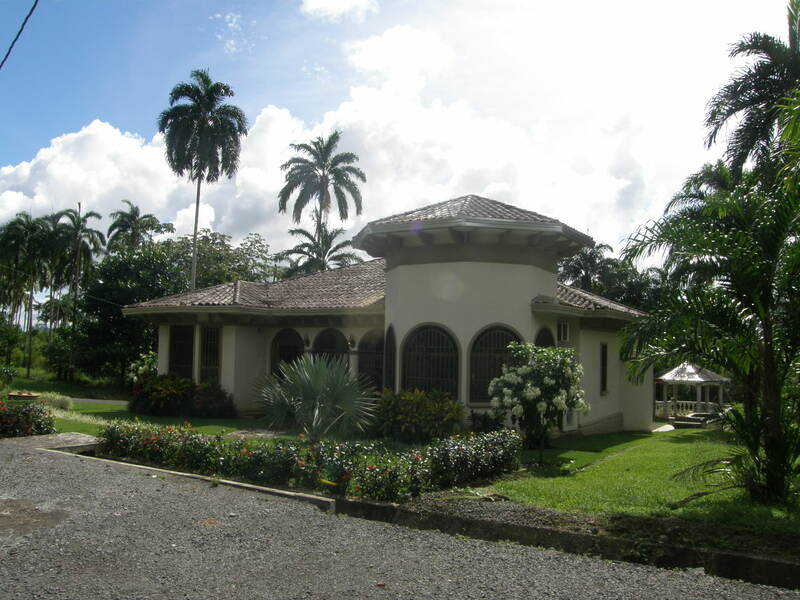 Beautifully appointed North American style home in quiet gated community of expats. 2100 sq feet in main house with 625 sq ft self contained guest suite over double garage. Some custom built in furniture included. We are offering for sale a beautiful, custom built home 2 miles from the town of La Concepcion in a quiet gated community of expats. La Concepcion is located just off the Interamericana Highway on the road to Volcan. At 1000 ft elevation, the climate is cooler and wetter than David but warmer than Boquete. This area does not get wind...ever. Excellent pavement right to the door. One of the nicest houses in Chiriqui. This house is tax exempt until 2030 which transfers with the title. The total area of construction is 4400 sq feet under cover. This includes an outdoor cooking area, terraza, front portico, double garage with work bench area, and a spacious self contained suite above the garage. This guest suite is large enough to rent by day, week or month or year. The square footage of the main house is 2100 sq feet, not including any undercover outdoor areas. This includes a well appointed kitchen with dining area, 2 bedrooms, extra bonus room off MBR (exercise), office, kitchen, living room, laundry, 2 bedrooms with large, dehumidified walk-in closet/secure room off of master. Outside the house all of the landscaping is complete including sidewalks, laundry (clothes line) area, a gazebo in the garden as well as a large custom made bird bath. -Extra outdoor bathroom as well as gardeners shed. Built to North American standards in 2010, the house is situated on an ample 1000 sq meter lot. -Dedicated 4 water line to property from a water treatment plant with an additional in house back up water system consisting of a 1750 liter reserve tank, pressure bladder and pump. There is also a concrete lined well on the property. -Everything in this home is top of the line granite, marble or Onyx everywhere, stainless steel appliances, stainless steel sinks, garberator. -Room A/C''s installed in 4 rooms for extra cooling if required. Provisions in all other rooms for A/C if desired. -11 zone security alarm system with a combination of movement and infrared sensors plus 3 keypads including one in the master suite. - 8 cameras located both inside and outside the home with a hidden monitoring system. -Extra security doors between the garage and house and between the main house and the upstairs suite. -Extra steel reinforcement on inside of garage door panels. -Currently has a small hospital with a new 2 story hospital currently being built. -30 min to downtown David. Moving to Panama? Get a moving quote today from our partner, Crown Relocations.